Spray energy in your life with Fizzy Energy, a luminous fruity floral fragrance with sparkling facets arousing all the senses. The notes include grapefruit, apple, pineapple, green papaya, jasmine, camellia, woods and soft musk. 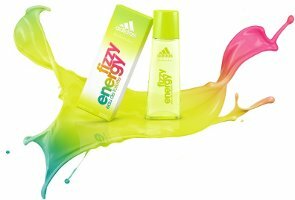 Adidas Fizzy Energy is available in 30 and 50 ml Eau de Toilette. The name “Fizzy Energy” makes me wonder whether I am supposed to wear it or drink it. They remind me of fizzy Fruit Pastilles! Don’t know if you get those in America? I don’t know either, but they sound fun! sounds like a new flavor of Fresca! If that’s the name they decided to pick I’d love to know what names they rejected for this. Excuse me, you smell wonderful. What is that fragrance you are wearing? Why thank you, it’s Fizzy Energy. I don’t mind the name. These are sort of the equivalent of sports fragrances for women.